"What do I do, I don't know what to do! If I stay I'm trapped, if I leave I'm alone! Oh God, in, out, in, out... I never saw Venice! I–"
The crushed man was a person who was crushed to death by the Dome. He suffered this unfortunate death when the Dome came down, covering Springfield. He couldn't make up his mind whether to go into town and be trapped under the dome, or stay outside and be alone. Because of his indecision, he ended up standing directly underneath the descending Dome, and as a result was crushed to death. 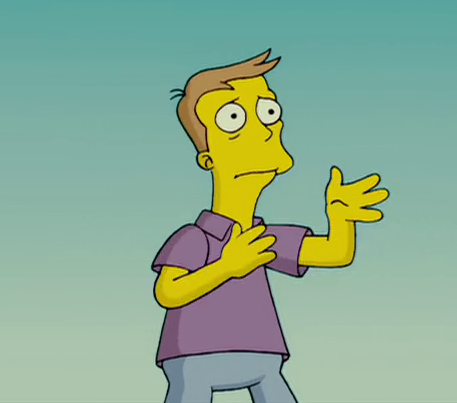 Edward Norton was meant to play the Crushed man in The Simpsons Movie but his lines were re-dubbed by Dan Castellaneta. Modified on August 13, 2016, at 05:26.